"You are my home now." On Friday, June 12, Toni Gonzaga and her longtime boyfriend (eight years, yo!) 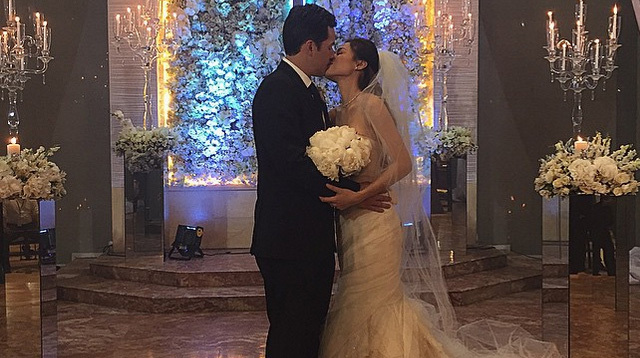 Paul Soriano finally got hitched. Our favorite part though? Their vows! Paul said, "When I saw you come down that aisle, I saw everything, my future, the beautiful mother of my children in the future—that was the rest of my life right there. My partner for life, my miracle. You are my number one priority right now after God. Just like the movies, happily ever after is right in front of me right now—and it feels great. Because sometimes you just watch that on television and at the cinemas. To have that in real life is overwhelming. It’s only something God can direct. I will never stop thanking Him for blessing me with [someone] not just physically beautiful but inside so generous, so giving. You love so many people and to feel that also is just overwhelming. "8 years was just super challenging. Stepping into your business was something very new to me even though my grandfather and my dad were in it. But to be now in the spotlight was just tough. There were always those people who wanted to harm us but Jeremiah 29:11 says 'No one will harm us,' and that’s what he did. It’s not about material things, it’s not about what you have, what you got; it’s the love I feel that makes me so rich, makes me so alive. So thank you for giving that to me. And God has really blessed me with you. I know and see and feel and hope and know that the future’s gonna be great." "I’m gonna be holding your hand now as we start the next eight years of forever." "I mean you know my love for film. And even as we speak, I’m actually producing and directing right now. I got my Super 8 [camera], guys. The reason I chose to shoot you on my Super 8 today is because we’re technically celebrating Super 8 years of love. So you’re my Super 8. "Everyone in the last eight years that we’ve been together always say that we’re perfect together. And the only reason we are perfect together is that we have a perfect God in the center of this, and let's make sure we keep that perfect God in the center of all this at all times. "I don't say this in public and you know that. We only do this in private, but I love you, Celestine." "Paul, as I look back, I couldn’t help but wonder why you never left. Our relationship was never easy. And every time I would ask you, 'Why are you choosing to stay with me?' You would simply answer, 'Because I love you.'" "For eight years you have fought for your position in my life. There were times that I saw you get tired, but you never gave up." "I know I’ve not been the best girlfriend [to] you. But from this day forward, I promise to be the best wife you will ever need. From now on, apart from God, you are now my number one priority. From now on, your happiness is my happiness, what makes you sad will make me more sad, and what hurts you will hurt me the most. "It has been a long journey my love, and now, we are finally getting married, and it is a great love story because God wrote ours." "It was exactly eight years ago from today when I said yes to become your girlfriend. And even then I knew in my heart that you’ll be the same man I’ll say yes to become my husband." "Happy anniversary, my love! And I am so excited to finally experience my life with you. We can now do whatever we want and there's no need to drop me home because now, you are my home. "For the first time we don’t have to text each other good night. We can finally say it face to face right next to each other. "I love you Paul, and thank you for giving me your last name."